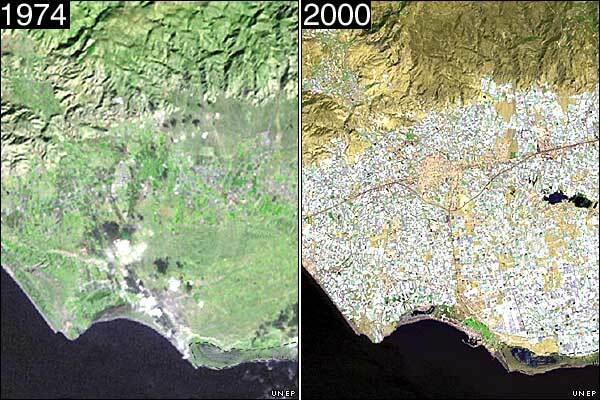 A new atlas of environmental change compiled by the United Nations Environmental Programme (Unep) reveals some dramatic transformations, including the change in land use in Almeria from the expanion of greenhouses. "The sunny south of Spain offers more to the national economy than simply tourism. Over the past 50 years, the small coastal plain (campo), some 30 kilometers southwest of the city of Almería, has been intensively developed for agriculture. An estimated 20,000 hecatres of extra-early market produce is grown in greenhouses in the Campo de Dalías, and it accounts for over $1.5 billion in economic activity. The area has a dry, mild, Mediterranean climate and is further sheltered on the north by the Sierra de Gador mountains. With just slightly more than 200 millimeters of annual precipitation to support crop growth, the area also relies on groundwater fed by small stream aquifers from the mountains to the north."